Should I Get Curtains or Blinds? Is it worth Recovering my old sofa? 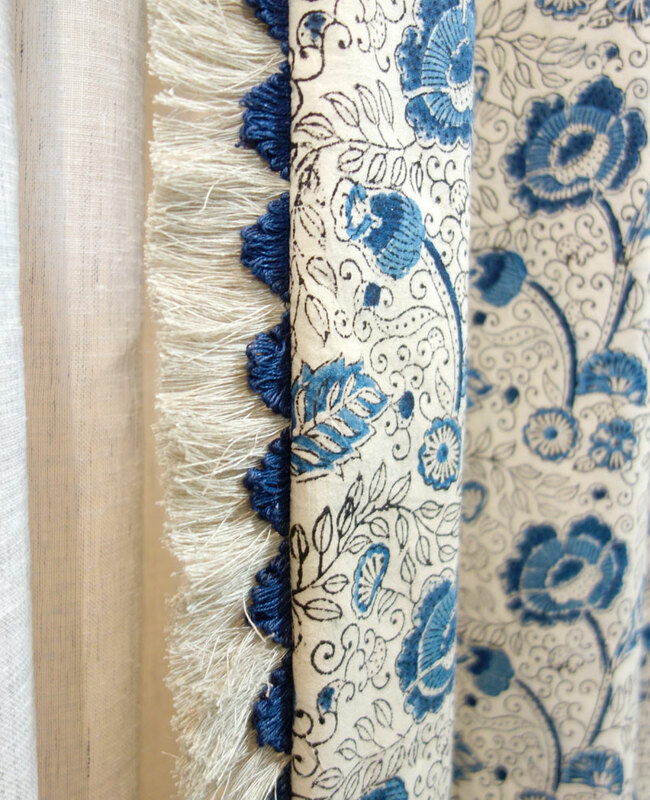 Chrissie explains how to use trims such as braids, fringes and tassels in interior schemes to add detail and interest. Q. How, When and Where To Use Trims In Interiors? Trims always go down the leading edge of curtains and often along the base or hem. Although often associated with more traditional curtains, trims can also be used on curtains in a contemporary interior. Achieve this look by using a neutral trim such as No Chintz’s “Link Braid” in White/Linen back on a natural linen fabric. This curtain uses a clever combination of Ric Rac, zig zag stitching and frayed edges. If you’re looking to create a more traditional look, try using a fan edge trim or fringe or both. Curtains made using 'China Tea Blockprint' fabric with ruche and fan edge fringe. Pelmets provide another opportunity to add a trim. For a more tailored look, try using a wide braid like our “Railway Braid” or for a lux look attach a heavy bullion fringe that falls below the base of the pelmet. Blinds, especially Romans, can be given the “wow” factor just by adding a row or two of trim. Flat braids work best down the sides of a blind, set in a few centimetres from the edge. Roman blinds with striped ribbon trim. 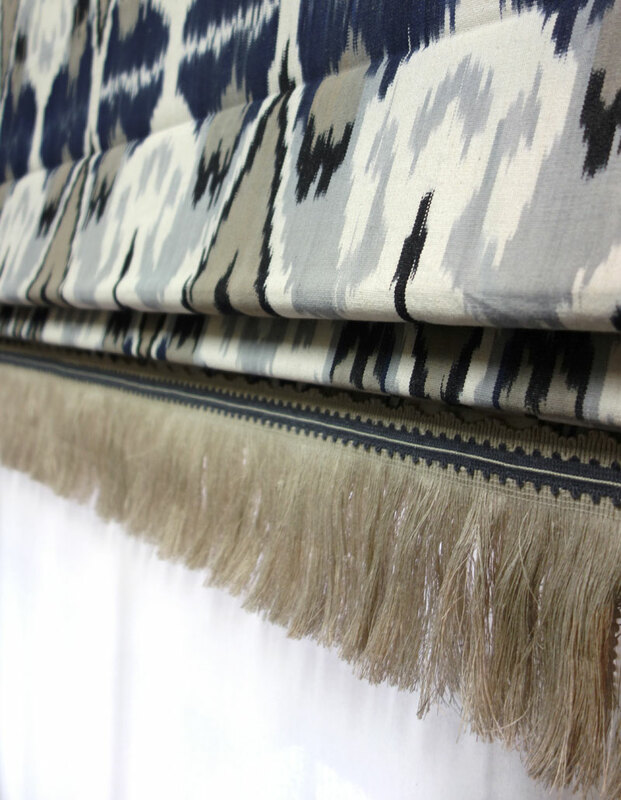 For a more deluxe look, our No Chintz “Box Fringe” which is 13.5cm deep, looks stunning along the base of a Roman blind. In this case, the fringe should hang below the bottom of the blind. No Chintz "Cashew Nut Love Ikat Fabric col. Ink/Taupe" with "Linen Box Fringe" and "Pretty Braid col. Navy"
Trims work best on the base of Roller blinds. 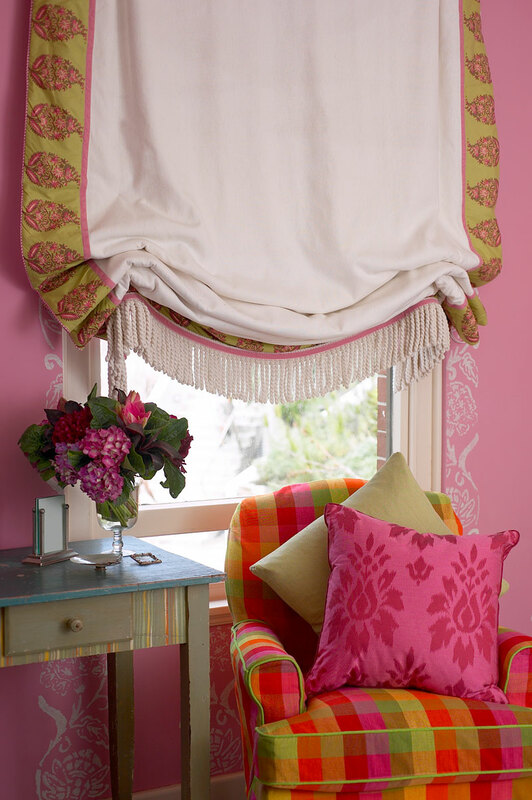 A Pom Pom fringe gives a touch of fun, especially in children’s rooms. Swag Roman blind with bullion fringe on the base. You’re only limited by your imagination when it comes to trimming cushions. From a single pom pom at each corner to multiple rows of poms poms sewn into all four edges, don’t hold back! There’s many ways to trim a cushion. Wider ribbons or braids can be used in the wall of a cushion and rectangular shaped cushions can be trimmed on the narrow ends only. You can also add trim to the face of a cushion to create contrasting panels. 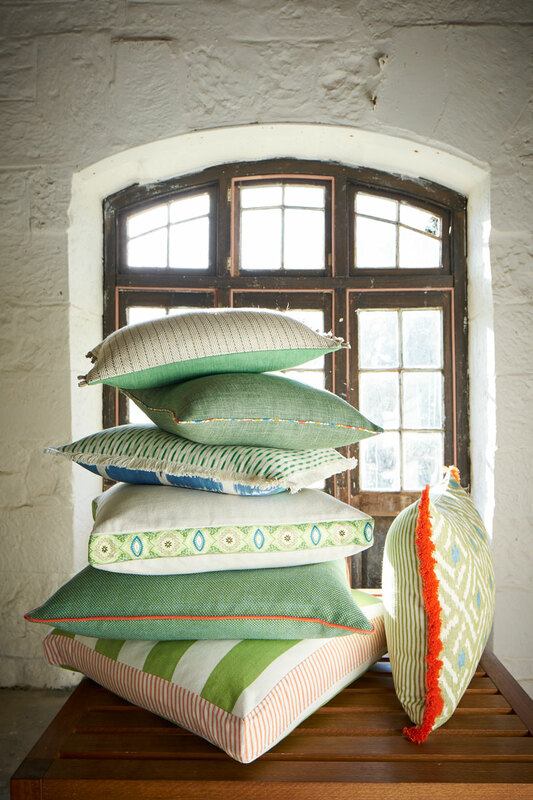 Try using more than one trim in the seams of your cushion. 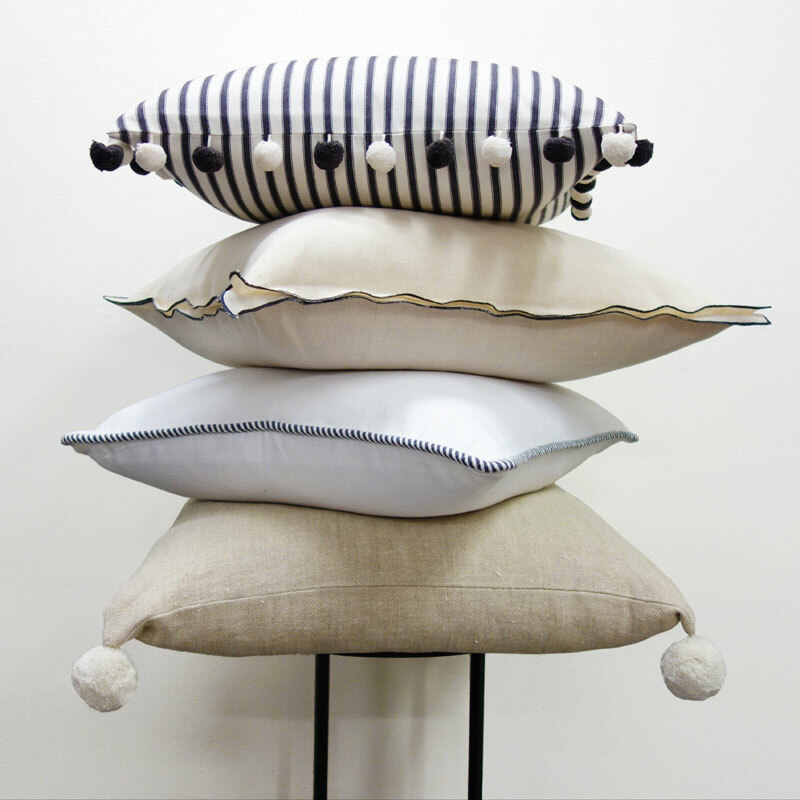 We often use two to three layers of our Fancy Block Fringe in different colours to make a truly special cushion. 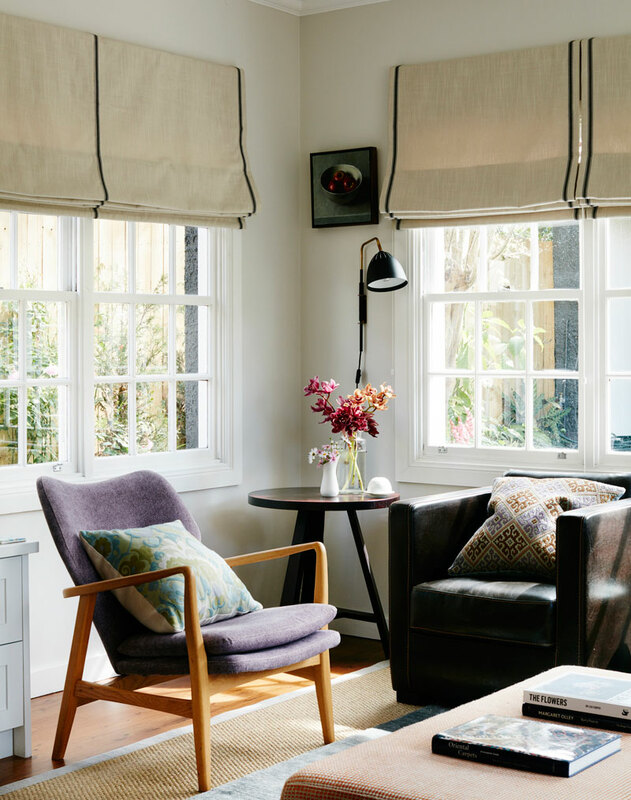 Mix piped, non-piped and trimmed cushions for a more eclectic look. For more trims, head in store or view our range online here. Hi Chrissy I have just read and article in the Australian woman’s weekly about your home, this lead me to your website. You have totally inspired me with your choice of colour and fabric combinations. I have soft grey walls throughout our home in Karaka, New Zealand, I feel it lacks excitement and personality, not truely reflecting the artist I am and my love for colour and textures. I am glueing the article into my inspiration workbook to refer to as I make decisions for my own home. In particular I love you paint colours - may I ask what the green paint colour is ? And the beautiful teal ? In fact I would love to know all the colours in the magazine article. Now I have your website I will be looking to buy some fabrics from you. Thanks for being wonderful. Kind regards Melanie Arnold.